Love to cook? Then you won't want to be without this Napoleon Country Crane and Hearth Pot. This handy accessory makes cooking with your fireplace a fun treat for the whole family. How long is the arm? The arm is 20.5" long. How big is the pot? How much weight can it hold? 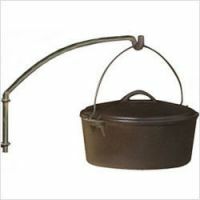 The pot is rated at a 2 gallon capacity and is rated to hold about 15 pounds. This has the look of an antique, worthy of any fireplace, in any decor, and ready for use. ProsFunctionally worthy of use in the kitchen, especially with the open hearth! my Son bought it for a camping trip and was able to make some excellent dishes with it! Now it is mounted in the Fireplace and we cooked everything from stew to chestnuts in it . It's well-worth the money !! ProsDurable; Stable; will last forever ~ just make sure you apply a light coat of cooking oil before storing it away. If not you might get some rusty patches.